Another Tweed Water spaniel has been found! It’s actually a cross between a golden retriever and a Chesapeake. This dog looks a lot like what I imagine a Tweed water spaniel looked like. 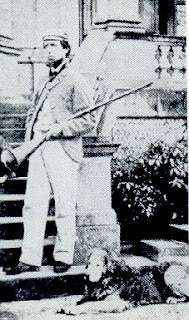 Remember that the Tweed water spaniel is an ancestor of several retriever breeds. I don’t think it is accurately called a water spaniel, for many descriptions of it suggest that it was more like a red, liver, or yellow St. John’s water dog. My reading of their exact conformation is much more like a curly-coated retriever but of a different color and with a less tightly curled coat. For that reason, I call it a Tweed water dog. This painting is said to be a Tweed water dog. It looks very similar to the dog in the photos, except for the tail, which does look a like that of an Irish water spaniel. A supposed depiction of a Tweed water dog. Here’s another painting that points to what a Tweed water dog might have looked like. The first litter of proto-golden retrievers born at Guisachan came from crossing a heavily-built way-coat named Nous with a Tweed water dog named Belle. We have a photo of Nous, but we have no idea what Belle looked like. However, form this painting of one of their female offspring, we can see that Belle was likely of a pale yellow coloration. She may have had brown skin and looked something like a deadgrass Chessie. It is very likely that the medium and lighter colors in golden retrievers (and maybe yellow flat-coats and yellow Labradors) come from this breed. The Tweed water dog picture with the game looks very much like our Murrays which are all shades of liver and very occasionally blonde.. many have a white patch on their chest. These dogs also came in colors other than liver, although the texts call them livers. The dogs were more likely red to yellow with brown skin, like some colors in the Chesapeake Bay retriever. Otherwise, if Belle bad been a true liver, the puppies in the litter would have been black. It is possible that the water spaniel influence was a bit stronger in some cases. I had a golden that had something like an IWS’s topknot. She was the dog that made it to the ripe old age of 14. She had bench lines close up in her pedigree. She had no retrieving instinct, and she was very mellow– as in not liking to move much. All the rest I’ve had have been variants on the setter-retriever, which is a theme in goldens and in virtually all flat-coats. 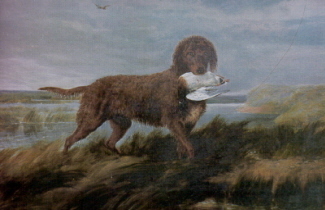 The TWS/Tweed water dog was said to be a cross between a “Newfoundland” (St. John’s water dog) and some endemic form of water spaniel that lived on the Northumberland/Scottish Borders coast. That’s the North Sea coast, which is also where East Anglia and the County of Norfolk are found. BTW, the red color and the head shape are definitely from the golden part of this dog’s heritage. Many field-line goldens have this type of head and it’s very hard to find a Chessie that is that shade of red. I forget what a true red is called in a Chessie, but it’s not as common as it is in Golden retrievers. on August 10, 2010 at 11:56 am M.R.S. One of the early strains of Chesapeake or Bay Dog was called the Red Winchester, FWIW.